I’ve been a compulsive caretaker, one who rescued or adopted kittens, taken in stray dogs, fed the neighborhood kids at lunchtime along with mine. Kids are grown and gone, but I still rescue animals…. and now I think I’ve rescued a weed. Three weeks ago a small sprout became visible in the soil of my summer geraniums (Pelargonium) that are wintering indoors. I was curious so I let it grow. It lost its plump cotyledons and began to shoot upright through the geraniums looking for sunlight. What a funny looking little plant, I thought. Is it a weed or a maybe a sprout from last summer’s autumn clematis? I thought the tiny fuzzy head might be a bloom but no, it just produces more leaves as it grows. The stem is woody and and hairy. The pubescent leaves have been opposite but the last three were whorled. I wonder what the next ones will be. The tip is as tiny as a pencil eraser and full of miniature leaves. No bloom in sight. I’m at a loss to identify what I’ve adopted but I think it’s cute. As long as I don’t develop a rash from it or it doesn’t turn into Audrey from Little Shop of Horrors, I’ll nurture “Harry” till there is an possible ID. If there’s a guess out there, let me know…. 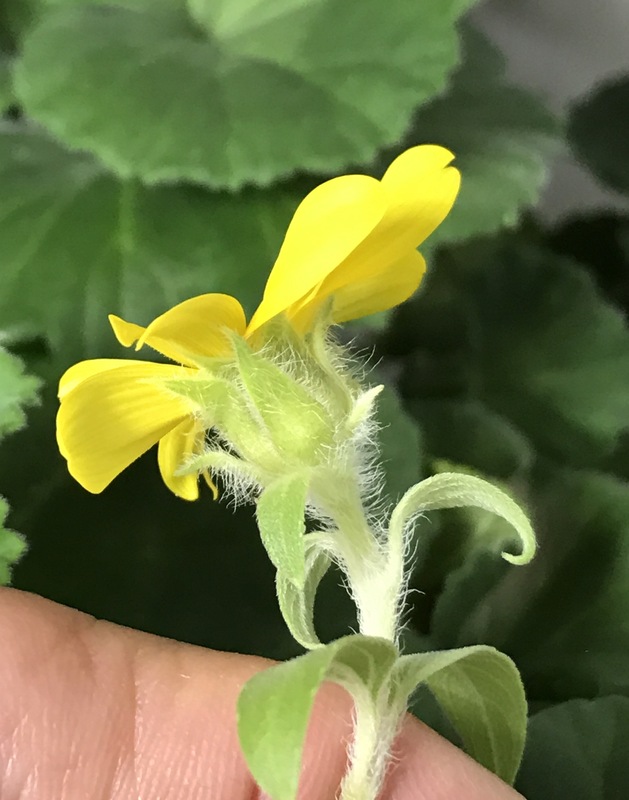 April update: the tiny stowaway in the geranium bed finally bloomed. I’m certain my friend who suggested it may be a sprout from last year’s birdseed is correct. Beautiful tiny yellow bloom. This entry was posted in Mystery Plant, New Hampshire and tagged Mystery Plant, New Hampshire, Weed by Annie. Bookmark the permalink. I’ve just started reading your blog- I think I found it thru your sister-in-law’s blog when I was looking at garden sheds. I am from Virginia but have lived in Galveston texas (7 years) and Buffalo, nY (last 17 years). My husband and I have vacationed in Maine for 40 years, 3 years ago we bought a house there and are preparing for a full time move there next month. I began my Maine garden 3 years ago so it could begin to establish itself. it’s so great to have your thoughts as a guide. I’ll be grateful for any hints as I NEED some of my southern favorites, such as boxwood, in my northern garden. Congratulations! I know you’ll love living full time in Maine. The hardiness zones vary from 3a to 6b. Google your area to find out your zone. Maine Botanical Garden is a great place to start. It’s zone 6b… about what I am in NH…and you can see how plants do in every season. And, yes, you can have boxwood. The terrible boxwood blight in Virginia has not reached us… yet! There are less susceptible cultivars and I think the list is on the NC State University website. The Garden Club of Virginia has had to remove mature large gardens at historic sites and replant. Have fun gardening! Thanks very much. I’m in zone 5B and already enjoy being a member of the Coastal Maine Botanical Garden- our home is just 45 min away so we are fortunate enough to get there often. I’m especially glad you are encouraging about boxwood. This year I’ve wintered some in pots in the basement and some in the ground. We’ll see. Look forward to reading more of your blog. Cheers. Dana, You must have found some good nurseries nearby. If you have a chance, stop by Fernwood Nursery & Gardens in Montville. It’s mostly a shade nursery, I think, but a fun place to visit and the owners are extremely knowledgeable and helpful. Were the geraniums anywhere near the bird feeder? 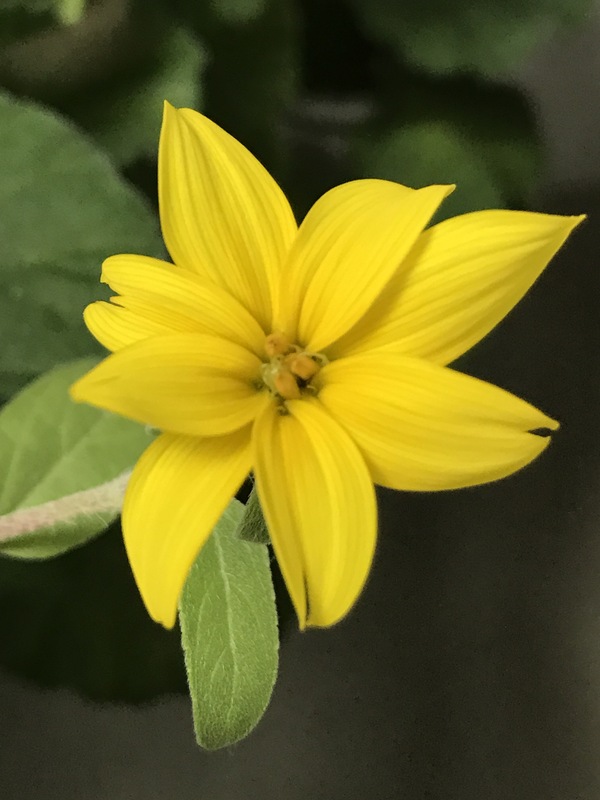 Maybe a sunflower variety? They often start out very hairy like this but…..
Hey, I had not considered birdseed. You may have something there. The pot of geraniums was indeed near the feeders.